Now that you understand the main components of Weave, let's take a look at how some of its functionality is handled at a high level. Almost all functionality in the Nest ecosystem for everyday operation is mapped onto resources and traits as part of the Weave schema. The Data Management business_center profile manages all requests for traits using a publish-subscribe model. These requests are messages specific to the Data Management profile. In this type of model, a publisher advertises traits (data to watch) and a subscriber reacts to changes in those published traits (data being watched). This function is called real-time trait management. The Data Management profile is the workhorse of Weave, and is generally referred to as Weave Data Management (WDM). Requests settings_backup_restore are a key element of WDM's real-time trait management. Requests are standard requests for action of a trait, with an expected response. These are different than a trait's commands in that they are not and cannot be defined in schema and are not specific to any trait. Notify flare Standard request that informs a subscriber of the state of a trait property, or of a specific event related to that trait. Update filter_center_focus Standard request to change the state of a trait property. View filter_tilt_shift Standard request to view the properties of a trait. Note: Both properties adjust and events control_camera in schema are delivered as part of a notify request. There are two types of WDM protocol roles: publisher and subscriber. These roles are assigned at the trait level. Key Point: A publisher is the source of data truth for a particular trait, and is determined by a resource schema. The WDM publisher role produces and serves versioned instances of one or more schemas to one or more subscribers, and sends notifications on a change to the schema to interested subscribers. These notifications are the notify standard requests. WDM sends a notify request flare from Resource 1 to all subscribers of Trait A, informing them of the change. Each subscriber updates their instance of Trait A accordingly. In diagrams throughout openweave.io, trait publishers are represented by light gray raised blocks. WDM sends a notify request flare from Resource 2 to all subscribers of Trait B, informing them of the change. Each subscriber updates their instance of Trait B accordingly. The WDM subscriber role views and consumes versioned instances of one or more externally-published schemas. It can change the versioned instance of a published schema with an update request, or issue an application-specific command. Note: A command is used for requests that cannot be accomplished by a standard request. WDM sends an update request filter_center_focus from Resource 2 to Resource 1, to request a change to Trait A. Trait A on Resource 1 is changed. Subscribers may also send a view request filter_tilt_shift to a trait's publisher, to view the properties adjust of that trait and keep their own instances of the traits in sync with the publisher. There are two types of WDM subscriptions. Subscriptions are established with a subscribe bookmark_border request. 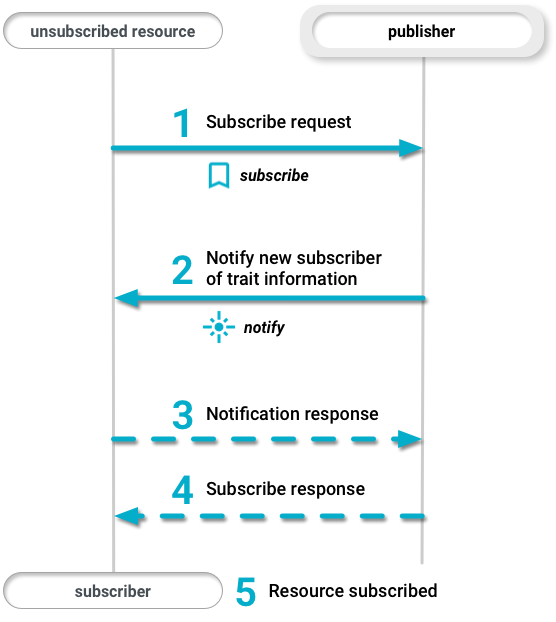 Figure 3 illustrates the basic message flow to establish a one-way subscription. One-way subscriptions involve a request from a subscriber to a publisher for one or more trait instances. For example, a mobile device retrieving the state of the home (structure) from a service. Mutual subscriptions are when resources subscribe to each other, and each act as both publisher and subscriber. An example of this is the Nest Guard and Nest Detect, which are part of the Nest Secure system. A mutual subscription allows both resources to manage the published schema and maintain the health and liveness of their subscription in a more efficient manner than two one-way subscriptions. 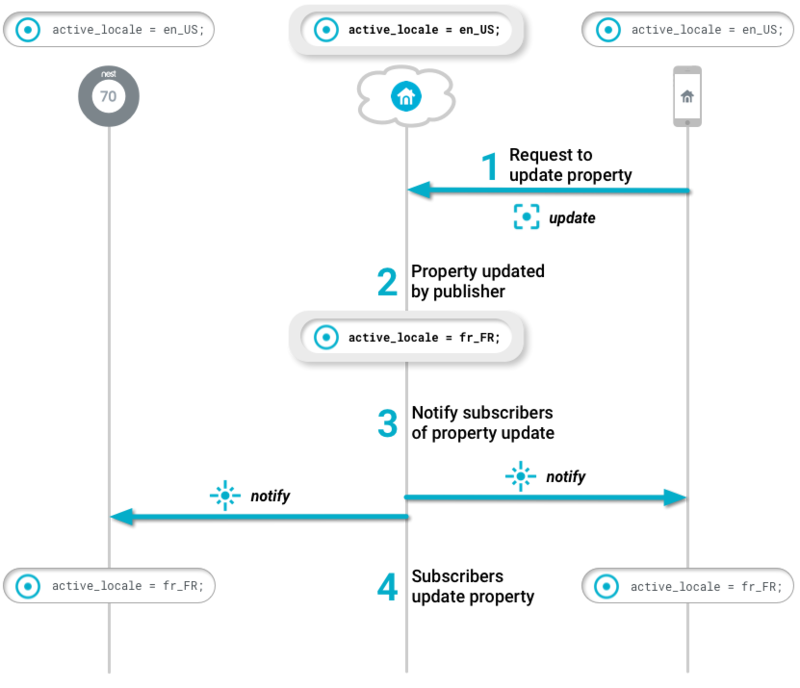 Let's look at a simple example of how WDM handles a change to a device's locale using a mobile app. Note: Application-specific data models can be applied to traits. The data models in Nest products include Capabilities, Settings, and State. Both traits are published by the Service resource and subscribed to by the Device and Mobile App resources. Each subscriber functions as a one-way subscription to the trait publishers on the Service resource. All resources in this example are part of the same Weave fabric texture. 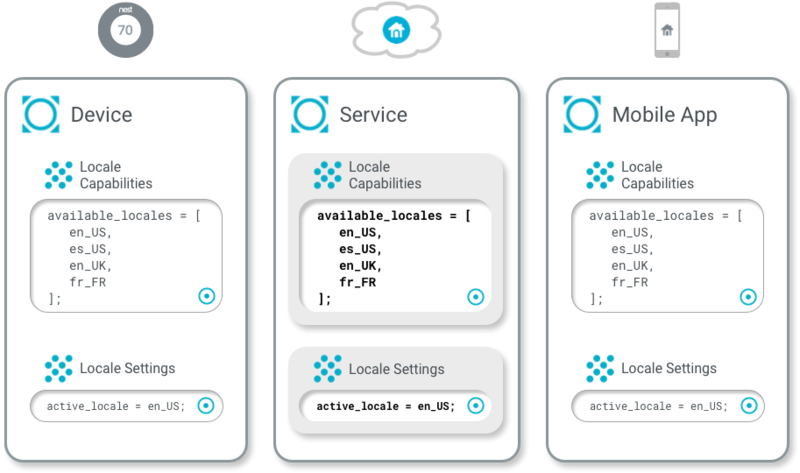 The Mobile App resource (subscriber) sends an update request filter_center_focus to the Service resource (publisher) to change the Active Locale property of the Locale Settings trait to fr_FR, one of the valid values of the Available Locales property of the Locale Capabilities trait. The Service resource changes the Active Locale property of the Locale Settings trait in its copy of the schema. The Service resource sends a notify request flare about the change to any subscribers of the Locale Settings trait. The Device and Mobile App resources (subscribers) both receive the Service resource's notify request flare and update the Active Locale property of the Locale Settings trait in their copies of the schema. This may seem very complicated when all you want to do is change the locale on your device from a mobile app. But by wrapping the versioned schema, publish-subscribe pattern, and requests together into the WDM profile, Weave ensures data integrity across all resources. It also ensures liveness, so when a device is restarted, it immediately notifies all subscribers of the state of its published traits, observes the state of subscribed traits, and reflects all those states in its copy of the schema without loss of functionality. If a resource unsubscribes from a trait, it retains a copy of the last-known version of the trait. It no longer receives notify requests flare from the publisher for that trait, but can still send update requests filter_center_focus to that publisher. Even resources that were never subscribed to a trait publisher can send requests to them. For example, a resource may not need to know about the state of a trait, but may want to send update requests filter_center_focus to change the state of that trait in response to an external event.